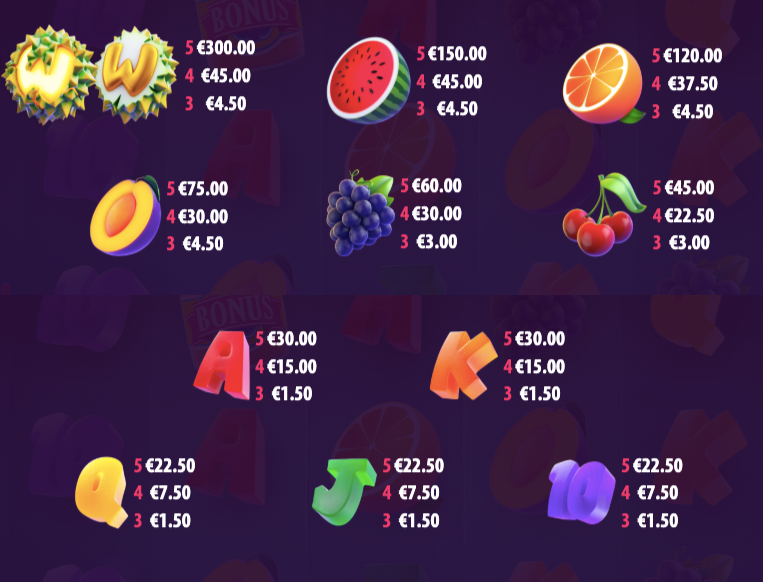 Durian Dynamite Slot Review - Fruit Explosion From Quickspin! Quickspin has been hot on releasing some great slots lately. With games like The Grand, Ticket To The Stars and Divine Dreams – they have had an exceptional start of the year. Well, hope you are ready for another one. Because Quickspin has prepared a fruit explosion for you all! 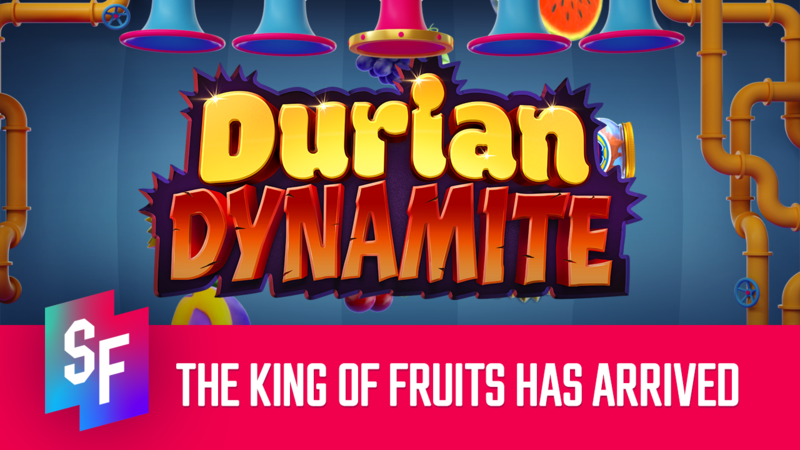 Durian Dynamite is their latest upcoming fruit-themed slot. Now, we know that the durian is perhaps not the finest tasting fruit as you might have heard or experienced. However, durian has a lot of funk flavor-wise to it and so does this slot. After all, they do all it ‘The King of Fruits’, for whatever reason. What type of flavor experience is exactly this slot packing? Moreover, does Durian Dynamite have the potential to be the ‘King of Fruit Slots’? 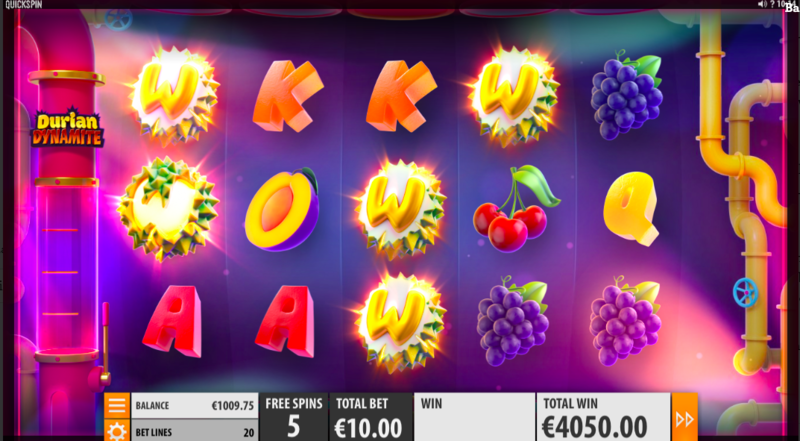 Find out in this Durian Dynamite slot review! Quickspin praises the Durian Dynamite slot as their first fully 3D-rendered game. That’s truly a great feat for the provider. They have already released more than a couple of good looking slots. But Durian Dynamite truly excels. The pristine design will be certainly one of the first things you will notice upon opening the game. The symbols are well-refined and their animations are dynamic and lively. Moreover, the background also nuances the fruit factory theme and it interacts well with the more motion-active aspect of the game. So, design-wise, the Dynamite Durian slot is top-of-the-notch. Moving on, Durian Dynamite has a standard five-by-three grid layout with 20 fixed paylines. Additionally, the slot has 11 total symbols – the Durian Wild, which is a central aspect of the game, five premium symbols, and five basic symbols. Now, the top premium symbol is not the highest valuing symbol. The wild symbol packs the biggest punch, rewarding a player with a 50X their bet for a full line of wilds. However, what’s under the hood? Well, Quickspin rates their slot on the 1-5 volatility scale with the max – 5. So, it’s high volatility. On top of that, the maximum win potential is 2515,25X times the bet. Moreover, the bet size ranges from €0.20 to €100 and has an RTP of 96.22%. As mentioned above, an integral part of the Durian Dynamite slot is the Durian Wild. There are two separate types of the wild – the Dynamite Wild and the Regular Wild. The Dynamite Wilds come into play, both during the base game and free spins, whenever the Dynamite Launch Feature triggers. This feature triggers at random and launches the Dynamite Wilds that are stacked into the tube. While in the base game, you can have no more than two – in the bonus game; you can get a total of four Dynamite Wilds. As the Dynamite Launch Feature triggers, it drops a Durian Wild in the Dynamite Reels and launches the Dynamite Wilds from the tube. Consequently, if any of the Dynamite Wilds hit any of the other wilds, they will split into pieces and launch three additional wilds towards random tile positions. Moreover, the splintered wilds can also hit other wilds and segment into two more separate wilds. In the Free Spins Bonus, it’s all the same. To trigger the bonus game, you need to collect 3 scatter symbols on reels 2, 3 and 4. 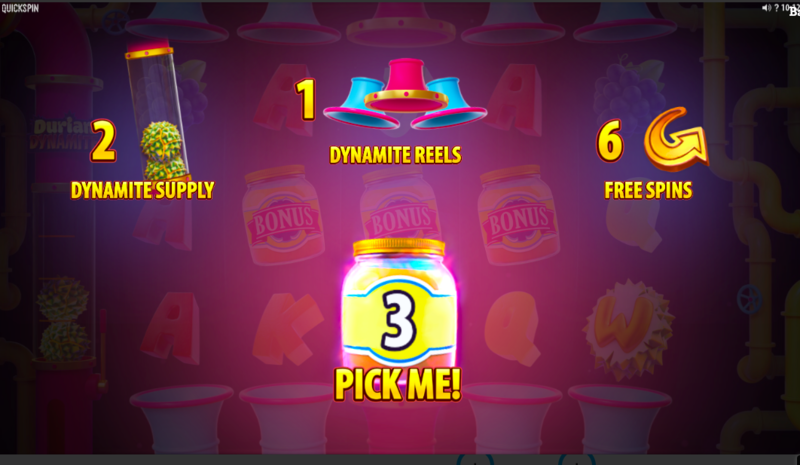 Upon entering the bonus game, you get 3 random picks of either additional free spins, with a maximum of 36 free spins, Dynamite Wild Supply with up to 4 Dynamite Wilds and Dynamite Reels with a maximum of up to 3 feature reels. Additionally, there is a lucky chance of getting up to 3 extra picks at random. Now, while the maximum win potential is not that high, the Dynamite Wilds can genuinely go crazy. One spin you might get just a few and the next, you see them popping all over the place. The variability and trigger frequency for the feature seems reasonable. Hence why the potential is not too over the top either. Nonetheless, there’s still an excellent chance to accumulate a fair number of big wins in the bonus game. To sum up, Durian Dynamite is a satisfactory slot from Quickspin. It’s not just the dazzling design that shines through this slot. It’s also the features. The Dynamite Wilds, as we pointed out, can strike big wins unexpectedly. Now, as pointed before, perhaps the win potential is not too staggering. But there’s enough durian juice to go around actually to make it worth playing. But there’s only so much of the fruit that you can tolerate. The same might be the case for the slot. It’s worth trying. But is it going to get a lot of play time? Well, that’s for the players to decide. This game has just about enough to keep people in the game. 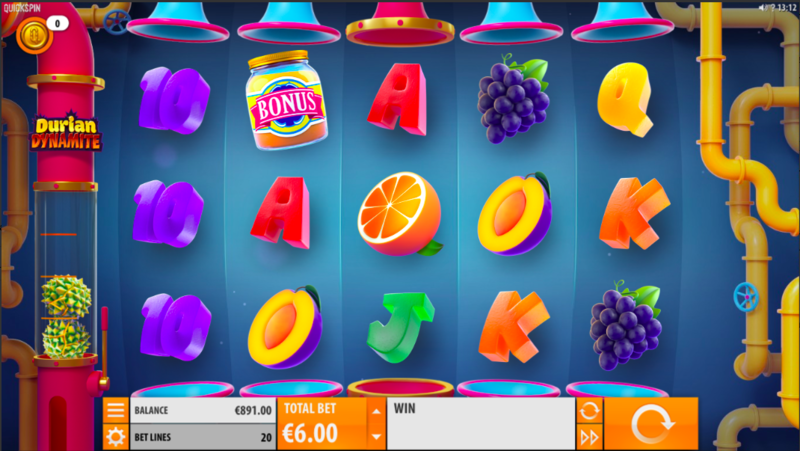 The slot releases on the 9th of April this year on all Quickspin slot online casinos.